Lois was born May 21, 1934 to Louie and Clara Bendikson. She grew up with one older brother, Leland, and one younger sister, Carleen. She spent more than fifty years living with her parents on a farm near Henning, Minnesota. Louie (Lois’s dad) made sure that Lois always had something to do on the farm. He helped her acquire rabbits, chickens, and lambs to feed and care for, then sell later. Lois planted cucumbers, tomatoes and other vegetables to eat and sell. She enjoyed making braided rugs from material scraps; she said it was relaxing. Lois also did child care in other people’s homes for many years, mostly for neighbors and family friends. Louie always had a dog around for herding dairy cows, and Lois became very attached to each of the dogs, but mostly to a black Lab named Sparkie. Lois remembered Sparkie when shown his photo while at the nursing home. When asked who the dog was, she smiled big and said “Sparkie.” She also had a black plush Sparkie, which she liked to cuddle to the end of her life. When Lois was in her mid-fifties, her parents had to move into a nursing home in Henning, because she couldn’t care for them by herself. Lois ended up in Wadena and lived there for about 25 years in her own apartment. She had several strokes when she was in her early to mid-seventies, and because she could no longer take care of herself after that, she ended up living at Comfort Care Cottages (assisted living) in Wadena in 2010. Then in 2016, Lois fell and broke her hip while at Comfort Care Cottages. 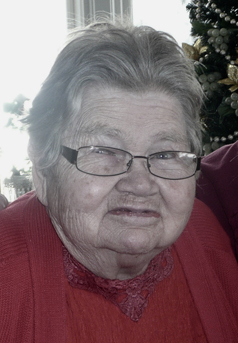 After surgery and recuperation, she needed full-time care, so Lois went to Fair Oaks Lodge Nursing Home in Wadena, Lois remained there until her death. Lois was preceded in death by her mother Clara and father Louie Bendikson; nephew Les Bendikson; brother Leland Bendikson, brother-in-law Dennis Nyhus, and sister-in-law Lucile Bendikson. She is survived by sister Carleen Nyhus, five nieces and two nephews.